The Song of Roland (French: La Chanson de Roland) is the oldest major work of French literature. It exists in various different manuscript versions, which testify to its enormous and enduring popularity in the twelfth to fourteenth centuries. The best and oldest of these versions is the one in the Oxford manuscript, which contains a text of some 4004 lines (the number varies slightly in different modern editions) and is usually dated to the middle of the twelfth century (between 1140 and 1170). The epic poem is the first and most outstanding example of the chanson de geste, a literary form that flourished between the eleventh and fifteenth centuries and celebrated the legendary deeds of a hero. The poem reflects the infusing of the Christian tradition onto the older, pagan traditions, and the "baptizing" of the virtues of heroism with a Christian meaning and value. The story is based on a relatively minor historical incident, the ambush or battle of Roncevaux Pass on August 15, 778 C.E., in which the rearguard of Charlemagne's retreating Franks was attacked by Basques. In this engagement, recorded by historian and biographer Einhard (Eginhard) in his Life of Charlemagne (written around 830), the trapped soldiers were slaughtered down to the last man; among them was "Hruodland, Prefect of the Marches of Brittany" (Hruodlandus Brittannici limitis praefectus). Then a song of Roland was begun, so that the man’s warlike example would arouse the fighters. Calling on God for aid, they joined battle. Taillefer, who sang very well, rode on a swift horse before the Duke singing of Charlemagne and Roland and Oliver and the knights who died at Roncevaux. This cannot be treated as evidence that Taillefer, William's jongleur, was the "author of the Song of Roland," as used to be argued, but it is evidence that he was one of the many poets who shared in the tradition. We cannot even be sure that the "song" sung by Taillefer was the same as, or drew from, the particular "Song of Roland" that we have in the manuscripts. Some traditional relationship is, however, likely, especially as the best manuscript is written in Anglo-Norman French and the Latinized name of its author or transcriber, called "Turoldus," is evidently of Norman origin ("Turold," a variant of Old Norse "Thorvaldr"). In view of the long period of oral tradition during which the ambush at Roncevaux was transformed into the Song of Roland, there can be no surprise that even the earliest surviving version of the poem does not represent an accurate account of history. Roland becomes, in the poem, the nephew of Charlemagne, the Basques become Saracens, and Charlemagne, rather than marching north to subdue the Saxons, returns to Spain and avenges the deaths of his knights. The Song of Roland marks a nascent French identity and sense of collective history traced back to the legendary Charlemagne. As noted above, the dating of the earliest version is uncertain as is its authorship. Some say that Turoldus, named in the final line, is the author; if so, there is still nothing known about him but his name. The dialect of the manuscript is Anglo-Norman, which indicates an origin in northern France. Some critics, however, notably the influential Joseph Bédier, held that the real origin of this version of the epic lies much further south. Perhaps drawing on oral traditions, medieval historians who worked in writing continued to give prominence to the battle of Roncevaux Pass. For example, according to the thirteenth century Arab historian, Ibn al-Athir, Charlemagne came to Spain upon request of the "Governor of Saragossa," Sulayman al-Arabi, to aid him in a revolt against the caliph of Córdoba, Spain. Arriving at Saragossa and finding that al-Arabi had experienced a change of heart, Charlemagne attacked the city and took al-Arabi prisoner. At Roncevaux Pass, al-Arabi's sons collaborated with the Basques to ambush Charlemagne's troops and rescue their father. The death of Roland at the Battle of Roncevaux, from an illuminated manuscript c. 1455-1460. Charlemagne and his army have been fighting for seven years in Spain. Marsilion, or Marsile, the Saracen King of Sarragossa, or Zaragoza, enters into a parliament with his nobles. At the behest of Blancandrin, Marsile decides to fake a surrender in order to secure the Frankish withdrawal from his lands. Marsile sends envoys to negotiate the terms of surrender with Charlemagne: Blancandrin, as chief envoy, promises in bad faith that if Charlemagne returns home to Aix-la-Chapelle, Marsilion will soon follow and convert to Christianity. The Christian lords enter into a discussion on how to respond to Marsile's offer. Roland distrusts Marsilion, but Ganelon, Naimon, and most of the others are in favor of taking the chance that he is sincere. Charlemagne agrees, but there is still the difficulty of finding an ambassador who will bear the message to Marsile. Charlemagne is reluctant to choose a valued knight, since Marsile murdered the last ambassadors that had been sent. Accordingly, Charlemagne rejects the offers of Roland and Turpin to carry the message and decrees that none of the Twelve Peers will be sent. Roland recommends that Ganelon be the one to undertake the embassy to Marsilion. Ganelon construes this as an insult, threatens Roland and then, while traveling in company with Blancandrin to Zaragoza, plots revenge. In Zaragoza, Ganelon tells Marsilion that Charlemagne's agreement is contingent upon two conditions. Firstly, Marsile will only be allowed to keep half of Spain, while the rest must go to Roland. Secondly, Marsile's uncle must be among the hostages offered as guarantees of good faith. After threatening to kill Ganelon, Marsile is advised by Blancandrin that the Frank is willing to betray Roland and the Twelve Peers. Marsilion offers Ganelon friendship and gifts of great wealth, and Ganelon promises to ensure that Roland and the Twelve Peers of France will be placed in the rearguard of the army rather than with the main body of Charlemagne's forces. This will enable Marsile, who has not the forces to defeat the Franks outright, to kill the twelve champions of France, without whom, Ganelon says the French will be unwilling to wage war. After Ganelon fulfills his side of the bargain, Roland, with Oliver and the other Twelve Peers, takes charge of the 20,000 strong rear-guard of the Frankish army. An army of Saracens, 100,000 strong, led by the nephew of Marsile and 11 other Saracen champions, is seen to be approaching the rear guard. Roland's friend, Oliver, advises him to blow his horn Olifant to summon the rest of the army, but Roland's code of honor obliges him to fight despite being outnumbered. The battle that follows is comprised of two parts. The initial onslaught of Saracens is repelled by the Franks, but only 300 Frankish knights, including Roland and most of the Twelve Peers, survive. The Saracens attack a second time, with Marsile himself leading a host of 300,000 warriors. It soon becomes clear that the Franks will lose. At the advice of Archbishop Turpin, Roland blows his horn, not in the expectation of rescue, but hoping that Charles will return to bury their bodies and revenge their martyrdom. When only Roland, Turpin, and Gualter de Hum are still alive, Roland slices off the right hand of Marsile. Marsile flees from the field and is followed by those of his men that still survive. Roland and Turpin are the only warriors still standing on the field of battle, and are as such victorious. Nevertheless, Turpin has been wounded in many places by Saracen projectiles and is bleeding to death as he administers the last rites to his fellow soldiers. Roland himself, while unharmed by any weapon, has blown his horn so hard that "the temple of his head" is ruptured, and he is bleeding to death. After Turpin dies, Roland climbs to the top of a hill looking south into Spain. He cracks his Olifant while bludgeoning a pagan to death who tries to steal his sword, then tries to break his sword on a rock: the sword does not break. Roland dies under a tree, facing south holding his sword Durendal and his Olifant. Charlemagne, meanwhile, has been riding back from France with all possible speed and has arrested Ganelon for his treachery. When he arrives at the battlefield in Roncevaux, he faints with grief. Charlemagne mourns and then sets out to overtake the fleeing Saracen army. Catching up to them in the fields before Sarragossa, Charlemagne's army slaughters them, and many Saracens who escape the sword drown in the waters of a nearby river. Marsile escapes into his citadel in Sarragossa. Because their army had received no aid from their Gods, the anguished inhabitants of Sarragossa deface the idols of their infernal trinity: The statues of Mahound, Tervagent, and Apollyon (Apollo) are dragged from the mosque and beaten with sticks. That night, Baligant, the Emir of Babylon (that is, Cairo and not the Babylon in Mesopotamia), arrives with reinforcements from Asia. Marsile dies passing his authority to Baligant. Charlemagne marshals his forces into national divisions under his greatest remaining champions: Bavarians, Germans, Normans, Bretons, Flemings, and Burgundians to destroy the Muslim army led by Baligant. The Christians destroy the Muslim army, and Charlemagne defeats Baligant in personal combat. The Christian army swarms into Sarragossa: The idols and artifacts of sorcery in the synagogues and mosques of Zaragoza are smashed, and 100,000 Muslims and Jews are baptized. Bramimond, the widow of Marsile, is captured, and Charlemagne gives orders for her to be converted, not by force, but by "parable and sermon." The Franks then return to Aix-la-Chapelle, where Roland's fiancée (and Oliver's sister) Aude dies of grief. Ganelon is tried for treason, but claims that his actions constituted a justified vengeance and that he did not commit treason. To settle the dispute, Ganelon's relative Pinabel fights judicial combat with Roland's friend Thierry, who wins. Ganelon is executed along with the members of his family that stood as vouchsafes of his innocence; Ganelon is drawn and quartered, and his relatives are hung by their necks. Queen Bramimond is baptized, and Charlemagne is finally satisfied. While he is sleeping, an angel comes to Charles and instructs him to provide succor to the city of Imphe, under attack from Pagans. Charles weeps and tears his white beard, crying that his life is miserable. The Song of Roland was, as one might say, an open source poem, and the different manuscripts differ dramatically. Hence, a date of composition is virtually impossible to determine with any certainty, since any single line that is able to be dated could be a later alteration, the addition of fresh references to a previously well-developed poem. Since such additions were commonplace for such poems, we are left with the general estimate that the poem was written, more or less, between 1040 and 1115, and most of the alterations were performed by about 1098. Some favor an earlier dating, because it allows one to say that the poem was inspired by the Castilian campaigns of the 1030s, and that the poem went on to be a major influence in the First Crusade. Those who prefer a later dating do so on grounds of the brief references made in the poem to events of the First Crusade. The poem is written in stanzas of irregular length known as laisses. The lines are of pentameter, and the last stressed syllable of each line in a laisse has the same vowel sound as every other end-syllable in that laisse. The laisse is therefore an assonal, not a rhyming stanza. On a narrative level, the Song of Roland features extensive use of repetition, parallelism, and thesis-antithesis pairs. Unlike later Renaissance and romantic literature, the poem focuses on action, not interiority. The author gives no explanation for characters' behavior. Characters are stereotypes defined by a few salient traits: For example, Roland is proud and courageous while Ganelon is traitorous and cowardly. The story moves at a fast pace, occasionally slowing down and recounting the same scene up to three times but focusing on different details or taking a different perspective each time. The effect is similar to a film sequence shot at different angles so that new and more important details come to light with each shot. Modern readers should bear in mind that the Song of Roland, like Shakespeare's plays, was intended to be performed aloud, not read silently. Traveling jongleurs performed (usually sections of) the Song of Roland to various audiences, perhaps interspersing spoken narration with musical interludes. This is a list of some of the principal characters in The Song of Roland. Baligant, Emir of Babylon; Marsilion enlists his help against Charlemagne. Basan, French baron, murdered while serving as Ambassador of Marsilon. Bérengier, one of the twelve paladins killed by Marsilion’s troops; kills Estramarin; killed by Grandoyne. Besgun, chief cook of Charlemagne's army; guards Ganelon after Ganelon's treachery is discovered. Charlemagne, Holy Roman Emperor; his forces fight the Saracens in Spain. Geboin, guards the French dead; becomes leader of Charlemagne's 2nd column. Godefroy, standard bearer of Charlemagne; brother of Thierry, Charlemagne’s defender against Pinabel. Grandoyne, fighter on Marsilion’s side; son of the Cappadocian King Capuel; kills Gerin, Gerier, Berenger, Guy St. Antoine, and Duke Astorge; killed by Roland. Hamon, joint Commander of Charlemagne's Eighth Division. Lorant, French commander of one of the of first divisions against Baligant; killed by Baligant. Marsilion, Saracen king of Spain; Roland wounds him and he dies of his wound later. 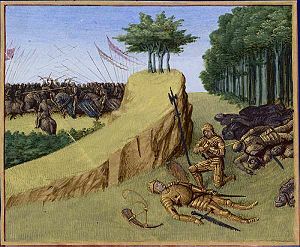 Milon, guards the French dead while Charlemagne pursues the Saracen forces. Ogier, a Dane who leads the 3rd column in Charlemagne's army against Baligant's forces. Oliver, Roland's friend; mortally wounded by Marganice. He represents wisdom. Othon, guards the French dead while Charlemagne pursues the Saracen forces. Pinabel, fights for Ganelon in the judicial combat. Roland, the hero of the Song; nephew of Charlemagne; leads the rear guard of the French forces; killed by Marsilion’s troops after a valiant struggle. Thierry, fights for Charlemagne in the judicial combat. Turpin, Archbishop of Rheims. Obviously, he represents the force of the Church. 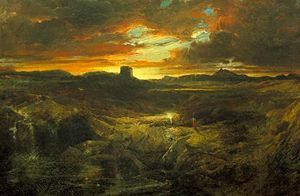 Childe Roland to the Dark Tower Came: Thomas Moran, inspired by Browning, 1859. A Latin poem, Carmen de Prodicione Guenonis, was composed around 1120, and a Latin prose version, Historia Caroli Magni (often known as "The Pseudo-Turpin") even earlier. Around 1170, a version of the French poem was translated into the Middle German Rolandslied by Konrad der Pfaffe (possible author also of the Kaiserchronik). In his translation, Konrad replaces French topics with generically Christian ones. The work was translated into Middle Dutch in the thirteenth century it was also rendered into Occitan verse in the fourteenth or fifteenth century poem of Ronsasvals, which incorporates the later, southern aesthetic into the story. A Norse version of the Song of Roland exists as Karlamagnús Saga, and a translation into the artificial literary language of Franco-Venetian is also known; such translations contributed to the awareness of the story in Italy. In 1516 Ludovico Ariosto published his epic Orlando furioso, which deals largely with characters described first in the Song of Roland. Shakespeare used the words "Child Rowland to the dark tower came" in King Lear Act 3, scene 4. In 1855, English poet Robert Browning wrote a 36-verse poem, Childe Roland, based on the Song of Roland. Browning claimed that the poem came to him, fully-formed, in a dream, and said of it, "When I wrote this, God and Browning knew what it meant. Now God only knows." In contemporary literature, Browning's poem inspired a seven-book fantasy epic written by novelist Stephen King, entitled The Dark Tower. Written from 1982-2004, the series features the hero Roland Deschain of Gilead, the last of gunslinger-knights from a parallel universe. ↑ The Latin Library, Einhardi Vita Karoli Magni. Retrieved May 22, 2007. ↑ "The Astronomer," Vita Hludovici. ↑ William of Malmesbury, History of the Kings of England 3.1. ↑ Wace, Roman de Rou 8013–18. La Chanson de Roland. Bibliotheca Augustana (Old French). History of "The Song of Roland"
This page was last modified on 24 November 2015, at 16:18.